Morton, Jennifer M. and Paul, Sarah K. 2019. Grit. Ethics, Vol. 129, Issue. 2, p. 175. Rodríguez-Pose, Andrés and Tselios, Vassilis 2019. Well-being, Political Decentralisation and Governance Quality in Europe. Journal of Human Development and Capabilities, p. 1. Carey, Brian 2019. The preference satisfaction model of linguistic advantage. Critical Review of International Social and Political Philosophy, Vol. 22, Issue. 2, p. 134. Jaffro, Laurent 2018. V—Forgiveness and Weak Agency. Proceedings of the Aristotelian Society, Vol. 118, Issue. 1, p. 107. Spence, David B. 2018. Energy Markets and Responsive Grids. Vol. 162, Issue. , p. 29. Mitchell, Polly 2018. Adaptive Preferences, Adapted Preferences. Mind, Vol. 127, Issue. 508, p. 1003.
de Souza, S. M. 2018. Too much of a good thing: Overtreatment in epilepsy. Journal of Evaluation in Clinical Practice, Vol. 24, Issue. 5, p. 1049. Bello Hutt, Donald 2018. Republicanism, Deliberative Democracy, and Equality of Access and Deliberation. Theoria, Vol. 84, Issue. 1, p. 83. Molla, Tebeje 2018. Higher Education in Ethiopia. Vol. 2, Issue. , p. 165. Nolan, Andrea and Lamb, Stephen 2018. Exploring the social justice work of early childhood educators. Policy Futures in Education, p. 147821031879628. Andreassen, L. and Di Tommaso, M. L. 2018. Estimating capabilities with random scale models: women’s freedom of movement. Social Choice and Welfare, Vol. 50, Issue. 4, p. 625. Medveš, Zdenko 2018. New Pedagogical Challenges in the 21st Century - Contributions of Research in Education. Sunstein, Cass R. 2018. “Better off, as judged by themselves”: a comment on evaluating nudges. International Review of Economics, Vol. 65, Issue. 1, p. 1. Dorn, Christopher 2018. Vergleich und Leistung in der funktional differenzierten Gesellschaft. p. 223. Kihlbom, Ulrik 2018. Genetic risk and value. Journal of Risk Research, Vol. 21, Issue. 2, p. 222. Wiesenthal, Helmut 2018. Rationalität und Organisation 1. p. 31. Keller, Tamás 2018. Dare to Dream: A Vignette Survey on Self-Selection in Secondary Education Track Choice. Sociological Research Online, Vol. 23, Issue. 2, p. 354. Tanesini, Alessandra 2018. Caring for Esteem and Intellectual Reputation: Some Epistemic Benefits and Harms. Royal Institute of Philosophy Supplement, Vol. 84, Issue. , p. 47. 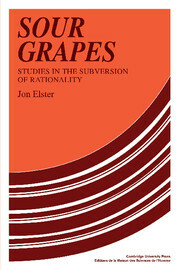 Sour Grapes aims to subvert orthodox theories of rational choice through the study of forms of irrationality. Dr Elster begins with an analysis of the notation of rationality, to provide the background and terms for the subsequent discussions, which cover irrational behaviour, irrational desires and irrational belief. These essays continue and complement the arguments of Jon Elster's earlier book, Ulysses and the Sirens. That was published to wide acclaim, and Dr Elster shows the same versatility here in drawing on philosophy, political and social theory, decision-theory, economics and psychology, as well as history and literature.